It might seem obvious, but sometimes the obvious needs stating. Twists in yoga are one of the best things you can do for your spinal health and mobility. By gently rotating the spine and stretching the muscles along it, twisting postures help maintain and can even improve upon the spine’s natural range of motion. Maintaining your back’s health enables your body to continue to perform everyday tasks with ease. If you’ve ever tried to park your car while your back has been injured you know first hand how limiting restricted movement in your back can be. 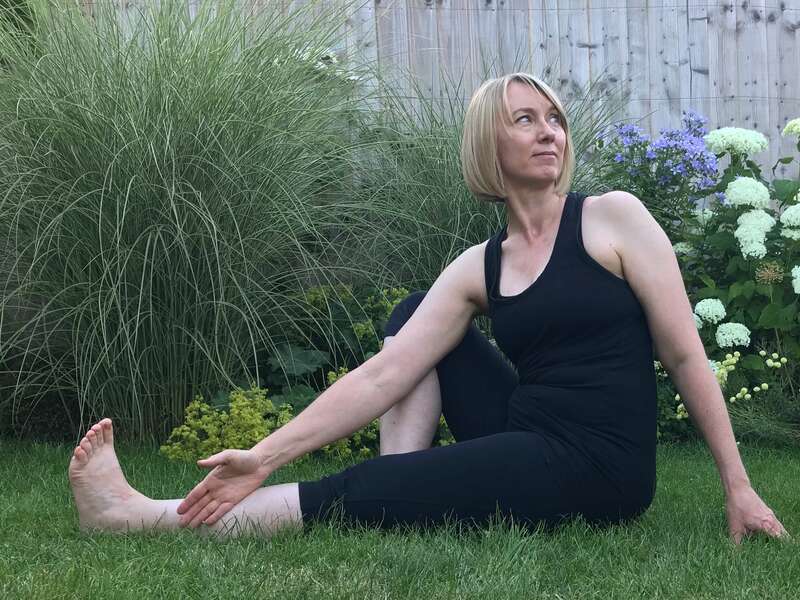 Regularly practising twists in yoga can also prevent or slow down spinal disc degeneration, even though this is often regarded as an inevitable part of the ageing process. Made of cartilage, spinal discs act as tough ligaments that hold our spine together. They absorb shock, lend movement and protect the spinal cord. Although not everyone will experience painful symptoms, it is a depressing statistic that about 30 per cent of adults will show some evidence of disc degeneration by the time they are 35 years old. Furthermore, almost all adults will have disc degeneration by the time they reach the age of 60. Degenerative disc disease is so common that is it regarded as a natural part of ageing. It’s why people get shorter as they age. Studies indicate that yoga teachers (and by extension presumably regular yoga practitioners) are less likely to suffer from disc degeneration and suggest that gentle forms of yoga, including Hatha and Scaravelli-influenced practices, slow this natural ageing process. There’s not enough evidence to fully understand why, but we do know that exercise can preserve and improve upon what functionality already exists. It also increases the flow of blood and oxygen and other nutrients to the entire back area, including muscles and discs, thereby keeping them as healthy as possible. When the alternative is chronic pain and decreased mobility, I’m all for twists. Do them. And do them regularly. If nothing else, you’ll find parking your car easier. There are lots of different types of twists in yoga and they can be practised standing, seated or even lying prone on the floor. Lying twists can be passive and might rely on the weight of the body to create the twist, but active twists don’t have to be complicated. You can even do them at your desk. If you want to rotate your spine then you need to lengthen it first. If you don’t, all you do is put pressure on the discs. Think about freeing up some space before you rotate. When you do start to twist, begin from the tail and work upwards. We don’t have much movement in our tailbone but it helps if you visualise starting there and moving slowly up along the spine rotating each vertebrae at a time. This helps avoid putting stress on your neck, which follows the movement organically rather than instructs it. After reading this article take 30 seconds out. Inhale and return to neutral. Did you give it a go? Spinal health does not have to mean fancy yoga! I particularly needed this post before riding in the back seat of the tiny little car we rented in Wales. As my sister and niece laughed at me contorting, I kept begging them to give it a go–but alas, they weren’t game! I do stretch my back each morning with a down dog or two and a plank. It helps loosen me up after all the bad guys I beat up in my sleep! HA, Monika! Jackie would probably enjoy Yoga. As for Jenny–she is a CrossFit person. As she says, “I want to get to the gym and throw heavy things around.” Ah, those 30somethings. What do they know? Ha.